Background: Natural orifice transluminal endoscopic surgery (NOTES) is a minimal invasive treatment. However, tissue dissection under endoscopy is still challenging due to the flexibility of endoscopy body and there is still no effective method for establishing a tunnel towards the targeted area. We previously showed that a new kind of thermogel could be submucosallly injected and served as a cushion for endoscopic dissection. Thus, in this study we investigated the feasibility and safety of tunnel creation using poly (lactic acid-co-glycolic acid)-poly (ethylene glycol)-poly (lactic acid-co-glycolic acid) (PLGA-PEG-PLGA) thermogel for NOTES in a porcine model. Methods: We prepared an injectable thermogel composed of PLGA-PEG-PLGA triblock copolymers which exhibited a low-viscous sol at room temperature and spontaneously transformed into a no-flowing gel at body temperature. This thermogel was used in NOTES in pigs. The success rate and adverse events were observed. Results: The PLGA-PEG-PLGA thermogels were successfully injected to the targeted areas under the guide of endoscopic ultrasonography and the tunnels were created by sucking the gel during NOTES as the endoscopy went forwards in all the three animals. The necropsy of the pigs showed no evidence of iatrogenic injury. No serious bleeding and perforation was observed. The results demonstrated that thermogel injection and tunnel creation by suction during NOTES were feasible, which simplified the procedure of tissue dissection and developed a new method of identifying the targeted area for surgical interventions without causing severe tissue damage. Conclusion: The application of thermogel for tunnel creation in NOTES could optimize current procedures and may have a promising prospect in clinical application. Natural orifice transluminal endoscopic surgery (NOTES) is a well-acknowledged therapeutic modality for selected patients, which has the advantage of rapid recovery and minimal invasion. In recent years, great progress has been made on NOTES, evidenced by the fact that the success rate has been greatly improved.,, However, the technique of NOTES is still challenging. How to effectively control the direction of the endoscopy and dissect the tissue by the endoscopists during NOTES is of vital importance., The traditional endoscopy could guarantee the accurate completion of intended procedures, while the flexible endoscopy has high mobility and the endoscopy tip is not easily manipulated., During NOTES, the tissue dissection is the most time-consuming and associated with high complication risk, which may be very difficult under flexible endoscopy. Previous experimental investigations have demonstrated that the establishment of tunnel by the injection of thermogel could simplify the procedure of endoscopic submucosal dissection, which acts as an excellent cushion system. This thermogel, a biocompatible and biodegradable polymer hydrogel, was made up of poly (lactic acid-co-glycolic acid)-poly (ethylene glycol)-poly (lactic acid-co-glycolic acid) (PLGA-PEG-PLGA) triblock copolymers, and exhibited a free-flowing sol at room or low temperature and spontaneously transformed into a semisolid gel at body temperature.,, Based on these findings, we hypothesized that tunnel creation using thermogel might also be able to simplify the NOTES procedure in the similar manner. Thus, in this study, the feasibility and safety of tunnel creation using thermogel for NOTES were examined in animal models. These results identified a new NOTES technique which could shorten the operation time and simplify the dissection procedure by establishing a tunnel toward the targeted area for surgical interventions under NOTES. The PLGA-PEG-PLGA triblock copolymer was synthesized via a bulk ring-opening copolymerization method in the presence of D, L-lactide (LA) and glycolide (GA) using PEG as an initiator and stannous octoate as a catalyst., In brief, 15 g of PEG (molecular weight [MW] 1500) was first added into a three-neck flask and dried under vacuum at 130°C for 3 h to remove the residual moisture from the polymer. Next, a given amount of LA and GA were added and stirred under reduced pressure at 100°C for 30 min. After the addition of stannous octoate (0.2 wt % of monomers), the reaction device was heated to 150°C, and the reaction mixture was continuously stirred for 12 h under an argon atmosphere. Then, the crude products were washed using 80°C for three times to eliminate the unreacted monomers and low-MW products. The residual water in the polymers were removed by lyophilization, and the final products were collected and stored at a −20°C refrigerator before use. The resultant polymers were soluble in water at low or ambient temperature and exhibited a reversible sol-gel transition as the temperature increased. The polymer aqueous solution was sterilized through filtration using a 0.22 μm filter. Three healthy, live male Lee-Sung minipigs were provided by the experimental animal center of Academy of Military Medical Science of the Chinese People's Liberation Army (Beijing, China) and were qualified for laboratory study, weighing 20–25 kg. The experimental setting was the animal research laboratories of Academy of Military Medical Science with endoscopy and emergency equipment. All experimental procedures were approved by the Ethics Committee of Academy of Military Medical Science for animal laboratory investigation and performed according to relevant Chinese regulations and the guide for the care and use of laboratory animals of the US National Research Council. The pigs were fasted for 48 h before experiment and anesthetized by intravenous injection of pentobarbital sodium, with monitoring of life signs and without tracheal intubation. Indigo carmine was added into the polymer aqueous solution for an easy view. Endoscopic ultrasonography (EUS) examination was performed, and the root of the celiac trunk was identified. EUS-guided thermogel injection by the fine needle in a volume of 30 ml was conducted into the celiac trunk, which was manifested as a hypoechoic region. The polymer aqueous solution was sucked into an inflation device (Encore 26, Boston Scientific) with a screw-handle and a pressure gauge and injected into submucosa through a 22-gauge fine-needle aspiration needle (EchoTip, Cook Medical, USA) which was introduced from the work channel of endoscope. Then, the polymer solution was transformed into a semisolid gel due to contacting with the physiological heat, resulting in the formation of an in situ hydrogel. A standard endoscope (Olympus 260, Olympus Optical Co. Ltd., Japan) was inserted into the stomach through the mouth and arrived at the targeted region. At 5 cm just above the puncture, a submucosal tunnel was established by myotomy, which was similar to peroral endoscopic myotomy, and an in situ forming blue thermogel could be clearly observed. Hereafter, a 1.5 cm incision was performed on one side of the gel using a dual knife (Olympus Medical, Japan). NOTES procedure was routinely performed as follows. The endoscope entered into the gel and moved forward gradually by sucking the blue gel until the junction of celiac trunk and abdominal aorta was observed under endoscopy. The clip was used to close the defect if necessary. The whole procedure was recorded by video, and the operational feasibility was evaluated as well as the complication including bleeding, perforation. After the procedure, all the three pigs were sacrificed by injecting 2 mmol/kg potassium chloride after being continually monitored for 1 h and the necropsies were performed immediately. The stomach and other adjacent organs were examined carefully to detect any signs of iatrogenic injuries caused by NOTES. To clearly clarify the establishment of the tunnel for NOTES, we chose the celiac plexus as the targeted area, which is a common anatomical structure for surgical treatment in clinical practice. NOTES procedures were performed successfully, and the celiac plexus was easily identified by establishing this gel tunnel in the abdominal cavity of all three pigs without complication. Each submucosal injection formed a hemispherical gel matrix. The cap-fitted endoscope was inserted into the gel matrix, and the gel was sucked easily. The average volume of injected thermogel was 36 ml (range 25–28 ml). The average operation time for the whole procedure was 35 min (range 28–41 min). The procedure was schematically shown in [Figure 1] and recorded in Supplement [Video 1]. There was no need for additional electrocautery or blunt dissection and no perforation occurred during the procedure. Postoperative bleeding was detected in one pig and successfully stopped by electrocoagulation. No obvious laceration of mucosa and muscularis propria was observed in the necropsy as well as iatrogenic injury to adjacent organs. All the three pigs did not become severely ill or die before being sacrificed. Great progress has been made on the technique of NOTES, which has the advantage of minimal invasion, low complication risk, avoiding skin incision and increasing the possibility of performing procedures under direct observation., The length and flexure of the upper gastrointestinal tract could increase the technique difficulty and make only the endoscopy available in the procedure of NOTES. However, the stability of the endoscopy is poor, resulting in the fact that the tissue dissection is quite difficult in abdominal cavity, which is the most time-consuming and risky for complication in the whole procedure. Recently, Khashab et al. have reported that the Cook gel was able to be used as a submucosal injection agent for the creation of tunnel in esophagus., In our previous study, a similar finding affirmed that the thermogel used in the present study also could greatly facilitate tunnel creation in stomach and had a unique function of submucosal autodissection that could be conducted in the cushion along the inherent anatomical layer. Thus, we used the thermogel in NOTES and tested whether its auto-tunneling function can simplify and facilitate the operation. Finally, our results demonstrated that the establishment of a gel tunnel towards the targeted area (i.e., celiac plexus in this study) under NOTES was accomplished conveniently and safely. After the gel was injected into the abdominal cavity before NOTES, a tunnel to the targeted area for surgery was created by sucking the themogel using endoscopy [Supplement Video 1]. In detail, we first injected the gel near the targeted area under EUS localization before NOTES. Then, the suction was performed as the endoscopy went forwards quickly to the location of celiac plexus without tissue dissection, which greatly decrease the technique difficulty. This auto-tunneling function was attributed to the in situ gelation of the semisolid themogel at the injection site. It can save the operators from lengthy abdominal dissection and avoid the possible associated complication, and thus simplify the operational process and shorten the procedure time of NOTES. This study focused on the gel tunnel creation in the procedure of NOTES, which could serve as a pilot investigation. The application of this kind of biomaterials would be further expanded in the future. For example, it can be introduced in the biopsy of mediastinum, abdominal cavity and peritoneum, radioactive ion implantation and celiac plexus neurolysis (CPN), which has been reported to be effective in alleviating the pain of advanced cancer. The short-term efficacy of EUS-CPN and transcutaneous CPN was fair, while the long-term efficacy was poor due to the incomplete destruction of celiac plexus., In NOTES, the ganglion and plexus could be directly observed and destroyed by electrocoagulation, enhancing the anti-pain effect. In addition, the celiac plexus is near the stomach, and the gel tunnel creation is convenient. In this way, the tunnel creation could simplify the procedure difficulty, shorten the procedure duration and avoid the complication, which facilitates the clinical application and promotion of NOTES. Taken together, our findings for the first time demonstrated that a thermogel injection and tunnel creation toward the targeted area for surgical interventions in the procedure of NOTES was feasible and safe in a porcine model, which could be recommended in clinical practice. However, there were still some limitations. First, how to conduct effectively NOTES and standardize the specific procedures has not been examined in the present work, which needs to be further explored. Second, the application of gel tunnel creation in NOTES was only performed in animal models, and related clinical trials should be planned in future researches. This study is supported by Grants from the National Natural Science Foundation of China (to, Yan Liu, No. 81470906) and the Beijing Nova Program (to, Yan Liu, No. Z161100004916145). Atallah S, Martin-Perez B, Keller D, Burke J, Hunter L. Natural-orifice transluminal endoscopic surgery. Br J Surg 2015;102:e73-92. Pucher PH, Sodergren MH, Lord AC, Teare J, Yang GZ, Darzi A, et al. Consumer demand for surgical innovation: A systematic review of public perception of NOTES. Surg Endosc 2015;29:774-80. Katagiri T, Otsuka Y, Horgan S, Sandler BJ, Jacobsen GR, Coker AM, et al. Feasibility and technique for transvaginal natural orifice transluminal endoscopic surgery liver resection: A porcine model. Surg Laparosc Endosc Percutan Tech 2017;27:e6-11. Baekelandt J, De Mulder PA, Le Roy I, Mathieu C, Laenen A, Enzlin P, et al. Postoperative outcomes and quality of life following hysterectomy by natural orifice transluminal endoscopic surgery (NOTES) compared to laparoscopy in women with a non-prolapsed uterus and benign gynaecological disease: A systematic review and meta-analysis. Eur J Obstet Gynecol Reprod Biol 2017;208:6-15. Sumiyama K, Gostout CJ, Tajiri H. Investigating deeper: Muscularis propria to natural orifice transluminal endoscopic surgery. Gastrointest Endosc Clin N Am 2014;24:265-72. Sakai P, Faintuch J. Evolving endoscopic surgery. J Gastroenterol Hepatol 2014;29:1132-8. Sun X, Liu Y, Min M, Bi Y, Xu Y. Linked color imaging technique assisted endoscopic diagnosis and interventions. J Cancer Res Ther 2017;13:735. Chen TH, Hsu CM, Cheng HT, Chu YY, Su MY, Hsu JT, et al. Linked color imaging can help gastric Helicobacter pylori infection diagnosis during endoscopy. J Chin Med Assoc 2018;81:1033-7. Hughes-Hallett A, Mayer EK, Pratt PJ, Vale JA, Darzi AW. Quantitative analysis of technological innovation in minimally invasive surgery. Br J Surg 2015;102:e151-7. Yu L, Xu W, Shen W, Cao L, Liu Y, Li Z, et al. Poly(lactic acid-co-glycolic acid)-poly(ethylene glycol)-poly(lactic acid-co-glycolic acid) thermogel as a novel submucosal cushion for endoscopic submucosal dissection. Acta Biomater 2014;10:1251-8. Yu L, Ding J. Injectable hydrogels as unique biomedical materials. Chem Soc Rev 2008;37:1473-81. Yu L, Zhang Z, Zhang H, Ding J. Biodegradability and biocompatibility of thermoreversible hydrogels formed from mixing a sol and a precipitate of block copolymers in water. Biomacromolecules 2010;11:2169-78. Yu L, Zhang H, Ding J. A subtle end-group effect on macroscopic physical gelation of triblock copolymer aqueous solutions. Angew Chem Int Ed Engl 2006;45:2232-5. Saxena P, Simons BW, Gabrielson K, Haito-Chavez Y, Valeshabad AK, Kumbhari V, et al. Anovel viscous dissecting gel for endoscopic submucosal dissection: A prospective survival study in a porcine model. Endoscopy 2014;46:605-9. Hawes RH. Lessons learned from traditional NOTES: A historical perspective. Gastrointest Endosc Clin N Am 2016;26:221-7. Bechara R, Inoue H. POEM, the prototypical “New NOTES” procedure and first successful NOTES procedure. Gastrointest Endosc Clin N Am 2016;26:237-55. Yu L, Zhang Z, Zhang H, Ding J. Mixing a sol and a precipitate of block copolymers with different block ratios leads to an injectable hydrogel. Biomacromolecules 2009;10:1547-53. Zentner GM, Rathi R, Shih C, McRea JC, Seo MH, Oh H, et al. Biodegradable block copolymers for delivery of proteins and water-insoluble drugs. J Control Release 2001;72:203-15. Yu L, Zhang Z, Ding J. Influence of LA and GA sequence in the PLGA block on the properties of thermogelling PLGA-PEG-PLGA block copolymers. Biomacromolecules 2011;12:1290-7. Khashab MA, Saxena P, Sharaiha RZ, Chavez YH, Zhang F, Kord Valeshabad A, et al. 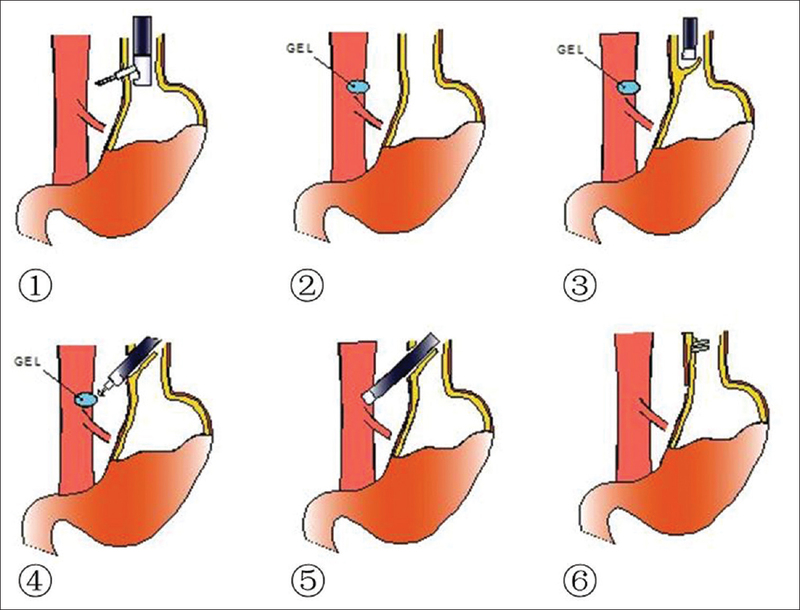 Anovel submucosal gel permits simple and efficient gastric endoscopic submucosal dissection. Gastroenterology 2013;144:505-7. Mekaroonkamol P, Willingham FF, Chawla S. Endoscopic management of pain in pancreatic cancer. JOP 2015;16:33-40. Luz LP, Al-Haddad MA, DeWitt JA. EUS-guided celiac plexus interventions in pancreatic cancer pain: An update and controversies for the endosonographer. Endosc Ultrasound 2014;3:213-20. Wyse JM, Chen YI, Sahai AV. Celiac plexus neurolysis in the management of unresectable pancreatic cancer: When and how? World J Gastroenterol 2014;20:2186-92. Saxena P, Khashab MA. New NOTES clinical training and program development. Gastrointest Endosc Clin N Am 2016;26:385-400.